Yesterday I began a reflection and critique on my most recent engagement with the ReThink Church campaign. Today I want to continue the reflection on some “meta-issues” that are related to, but not specifically about, ReThink Church. However, before I go any further I do want to say that I really appreciated the enthusiastic and collaborative leadership that Ken Sloane and Jennifer Rodia brought to the event. The powerful witness to shared leadership between male and female, clergy and laity, older and younger offered as much grace as anything they said, and I thought they worked together amazingly well. they are both very good at what they do. In my opinion, ReThink Church reflects the current cultural confusion between marketing and communication. Marketing is all about message — creating a compelling message/identity/brand and transmitting it effectively. This is the remnant pitfall of late 20th century “3G” communication technology. When communication technology developed that allowed single point broadcasting to a wide multi-point audience (think radio, television, movies), the very definition of communication changed. With the advent of the “4G” — multi-point/multi-platform communication between points and platforms — communication is returning to a healthier place. In classic communications theory, there are five aspects of effective communication — creation of a message, transmission of a message, reception of a message, interpretation of a message, response to/application of a message. Dialogue depends on a dynamic interaction of these aspects. The newly emerging “polylogue” (I love that term…) depends on the full engagement of all aspects as well. But the 3G culture of the 2oth century displaced communication with marketing — creating and transmitting messages, disregarding reception and interpretation, and evaluating response based on numbers — sales, attendance, customers, clients, etc. Without direct, clear qualitative feedback throughout the process, many decisions are made based on assumptions and probabilities rather than direct interaction. The impact on the church has been to adopt such monologue messaging and call it communication. Dynamic interaction that leads to understanding is a secondary value. We “communicate” in the church through sermons, announcements, newsletters, posters, bulletin inserts, signs, emails, websites, and other impersonal, uni-directional methods. The unintended consequence is an over reliance on representational communication. For example, representational evangelism is defined as using monologue to invite people to church — ads, door hangers, bumper stickers, tv and radio spots, websites (information based), holy SPAM, and a dozen other creative impersonal means. Relational evangelism, on the other hand, is face-to-face (1G), point-to-point direct (2G), and interactive, engaged networked (4G) communication. 3G monologue communications (billboard, tv commercial, newspaper/web ad, radio/television broadcast, etc.) are still of value, but only in service to the emergent 4G culture. In the church we are still operating behind the curve. But this is a both/and, not either/or situation. Much of our church is stuck in a 2G mindset struggling with how to employ 3G tech. It is unrealistic to think we can all adopt 4G culture as the norm without a long, steep learning curve. We need to be taught how to navigate the new reality well, though our tendency is to use what we know and pretend it’s new. Many websites are nothing more than 4G technologies being used to host 3G content (think most information websites). When something big happens in the world, I will turn to the Internet (4G) to visit a new site (3G) to get the latest post. My son will turn to the Internet (4G) and connect to a global community through social networking, multi-platform direct communication (4G). Paradigm shifts are never clean, and this one is no exception. Our modern/post-modern cultural propensity toward breadth over depth is a challenge. We have got to learn how to go deep as we go wide. Superficiality and inauthenticity are the greatest concerns of spiritual seekers who are not coming to church, those who have left the church, and those in the church who are growing ever more disillusioned. The focus on “more” (quantity) comes as a cost to “better” (quality). We must do a better job balancing the two. ReThink Church is helping us deal with breadth, and where the message is received by healthy congregations, the tools and resources can help with depth. But we need more distinction and clarity between the superficial and the truly transformative. I ask people to wrestle with the following distinction when I lead workshops on outreach and evangelism (and radical hospitality): what is the difference between entertaining guests and welcoming someone to live in your home. Every group makes the immediate distinction. Both require kindness, friendliness, openness, etc., but the best thing about company is that they go home. To open your home to a newcomer is a whole different matter, requiring much greater sacrifice, discomfort and adjustment. ReThink Church is doing a wonderful job of helping us to entertain company. I have yet to find the resources necessary to help people welcome newcomers to the family. This, for me, is the key difference between change and transformation. There is great value in getting back to basics. Prayer, worship, faith sharing, spiritual formation in close community (small groups) and simple Christian service are where spiritual seekers are asking for clarity and guidance — both inside and outside the church. Until we get the foundation laid, there is little we can build that will have lasting value. 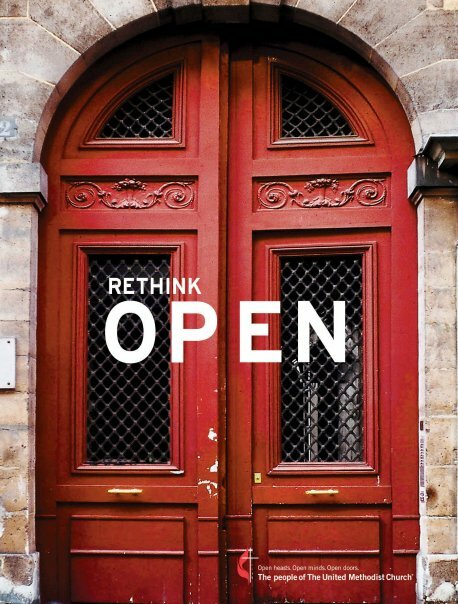 ReThink Church tackles some of the important basics — being open, welcoming, inviting, and flexible. Our congregations simply need to remember there is a lot more to the story, and that it isn’t all about us — The People of The United Methodist Church — but about becoming the body of Christ. While I like the idea of Rethink Church, it is not the final word. None of the “Rethink” programs are whether, church, evangelism, worship, etc. They can only encourage us to put some thought into what we do. These programs can give us tools, give us training, and help us visulaize what could be. None of these programs can get an entrenched and static congregation to actually do anything. It might also be pointed out that probably 80 percent of the people in the pews have no idea what any of this is about. That is the big problem with any program like this. They all assume that people, properly motivated and trained, have a desire to move forward. Many congregations have a deep-set desire to either stay right where they are, or to go back to a lovely little place called, “the Good Old Days.” The very fact that we are commenting here in United Methodeviations means we are something of an odd duck and an endangered species. Thanks for these comments. You’ve articulated what I’m sure many of us in the UMC have been trying to as we’ve watched various iterations of ReThink Church/ten thousand doors, etc. get rolled out. Nothing wrong with going back to some of the early models of Wesley’s small group discipleship if we are truly interested in making disciples. Just because we want to focus more on building community in these class meeting settings, that doesn’t mean we’re taking as step back. We’ll probably come across as more genuine and actively live out what the ReThink Church campaigns are trying to do: promote inclusiveness and rebrand the perception of these people called methodists.